What Brought Me Back to Sudan Against My Will Twice? Three groups of people worked hard in Sudan and abroad to destroy any chance for me to settle and begin new life in Africa. These groups are: 1- the Fulani (Fellata); 2- the corrupt; and 3- the failures. They know very well that any new beginning for me will be very successful and I will be powerful. They rightly knew that I will reveal them in large and deep scales. Fear; hatred; and jealousy brought them together against me. Bringing me back to Sudan is really the best way to contain and limit my dangers, with the option of eliminating me or detaining me are at hand easily at any time, if necessary and bearable. My ideology is indigenous liberal Sudanese Nationalism. It is secular; tribalistic; non-ethnic; and it is against European Globalization; secret societies; and trans-nationalism. It is about equal empowerment for all native tribes and about absorbing settlers into their fabrics, with new citizenship laws. This nationalistic ideology considers both Left and Right politics as twins of imperialism. This ideology shall re-invent democracy and add to the conventional party-dominated politics the legitimate influences of tribes and trade/professional unions. It shall convert the single dimensional democracy to a multidimensional system. It shall reform and confront the rotten domestic and foreign systems at once. Fortunately, I know how much violent, deceptive, and racist are the European elites (whether in Europe; America; Australia; Canada; or Africa) and the Arabs. Many African governments are stupid or/and puppets of the West (Europeans) and to Arab petrol-dollars. This is particularly true where I sought asylum and protection for 9 painful years. They did not see me as a useful asset; but they considered me a harmful liability. The corruption of the World refugee system is being administered by a bad network composed of: bureaucratic UN; governmental diplomatic missions; unethical security apparatuses; and greedy Western NGOs. Any comparison between Arab and European refugees at one hand, against African and Asian refugees on the other will prove the corruption of the World refugee system. This must change. 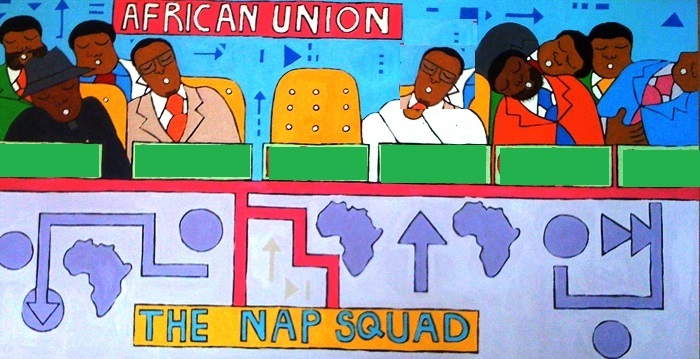 Can the African Union function?